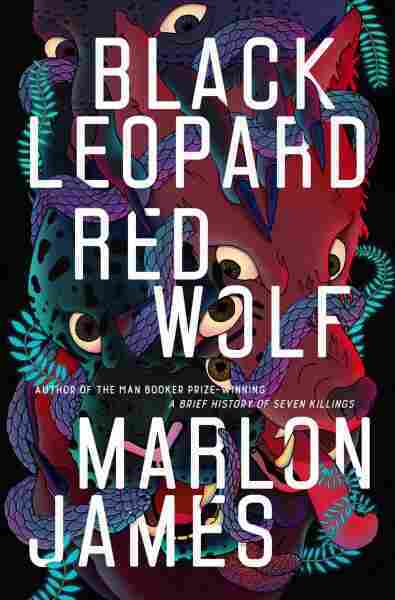 Book Review: 'Black Leopard, Red Wolf,' By Marlon James Our critic likens reading Marlon James' new epic fantasy to being slowly eaten by a bear that occasionally cracks jokes — painful and strange, but upsettingly beautiful for all that. I had never seen a bear so close before. Excited, I pulled the car up and parked near where I saw the bear vanish, and had my hand on the door before I came back to myself and thought, what am I doing? It's a bear! I drove away unharmed. There are things in one's life that are best appreciated from a distance, and this book is one of them. Black Leopard, Red Wolf opens with the lines "The child is dead. There is nothing left to know" — a statement impressively belied by the book's subsequent 620 pages. A man called Tracker — the titular Red Wolf — is in prison, being interrogated about that child's murder, and we are witness to his one-sided conversation with his inquisitor. From there the narrative folds and unfolds into different shapes: The inquisitor makes Tracker read a transcript of their exchange for confirmation, giving us access to outside voices, and later the inquisitor brings a griot, a singer-storyteller, to add testimony about a portion of Tracker's life he refuses to describe. The plot is ostensibly Tracker telling first the story of his life, and then the story of the quest to find this child not once, but twice. But in reality Tracker's voice is a magnetic field around the compass of plot, shifting and distorting, making its needle spin and spin and spin through interlocking stories told by a Leopard, witches and anti-witches, demons, slavers, a prefect, a queen. This is not a book to be read in a hurry, and yet it is difficult to dwell in. Besides the viciousness of its contents — frequent rapes and mutilations of men, women, and children, related both matter-of-factly and in harrowing detail — the book fights against its own chosen style, the oral telling of stories marked by interruption and digression towards the dark and upsetting, almost as a toll to be paid for pursuing the narrative. The beautiful flexibility of voice is counterpointed by a stiff absence of anything around long passages of dialogue, such that exchanges between characters feel like reading a play, or like archery — a twang, an arrow shot, and only the reply indicates whether or not it hit its target. Black Leopard's utter immersion in threat is as astonishing as it is disquieting. The fantasy Africa — wonderfully illustrated by James' own maps, separating out the book's sections — is rich and dizzyingly imaginative, but also a place where humans are very low in the food chain, always at risk of being raped and consumed by lightning-vampires or ceiling demons or baby-quartering witches. It is a book as inhospitable as the cell in which we meet Tracker – and it isn't until he stops speaking to the inquisitor and seems to be telling the story for its own sake, reliving it, that I felt able to exhale into the book and find space to stand. Everything hurts and exhausts, even as you want to know more, want to love the narrator who holds you constantly at arm's length. Marlon James was recently profiled, brilliantly, by Jia Tolentino at the New Yorker. Her piece included a supple and insightful reading of this book with which I agree so thoroughly that I have little to add, having even highlighted the same sentences she did, identifying passages that double as wry or sharp authorial asides. One of those is the inquisitor's remark that Tracker's "account continues to perplex even those of uncommon mind," which made me laugh when I read it, as I was in fact perplexed — as much by the text as by the repeated media comparisons of the book to the work of J. R. R. Tolkien or George R. R. Martin. Reading 'Black Leopard, Red Wolf' was like being slowly eaten by a bear, one inviting me to feel every pressure of tooth and claw tearing into me. I understand where those comparisons come from, the publicity strategies that underly them, but they are wildly inaccurate to the experience of reading this book, which is more like if Toni Morrison had written Ovid's Metamorphoses: Painful and strange, full of bodies shifting from personhood into meat, and somehow, always, still, upsettingly beautiful. This isn't Tolkien's grief-stricken melancholy, or Martin's calculating, character-forward plot mechanics; it's horror and tragedy by way of fantasy, nothing discrete, everything penetrating everything else. Reading Black Leopard, Red Wolf was like being slowly eaten by a bear, one inviting me to feel every pressure of tooth and claw tearing into me, asking me to contemplate the intimacy of violation and occasionally cracking a joke. It was a harrowing, horrible experience I'm not keen to repeat. But I can't deny that having finished it, I went back to the beginning to find things I now better understood, felt better able to withstand — as if in hollowing me out the book had made space for itself, had given me something in exchange for everything it put me through. I don't know what that is yet. But I have nothing else like it.